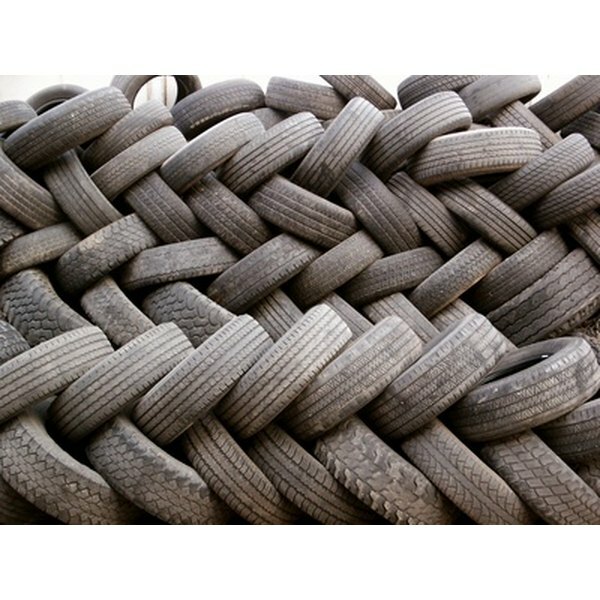 Rubber used to make tires emits vapors known to cause illness and disease among those working with it. Rates of heart and lung diseases and certain cancers were higher for those in tire manufacturing over several decades, the Centers for Disease Control and Prevention notes. Studies indicate that exposure to carbon disulfide, used in the manufacture of the rubber used in tires, leads to increased risk of heart disease. Exposure to carbon disulfide occurs by breathing vapors or consuming it in water or foods. According the Environmental Protection Agency, breathing high levels of carbon disulfide can be life threatening due to its effects on the central nervous system. Even breathing low levels over long periods can cause problems. Benzene, an irritant, toxin and carcinogen, is used to make the rubber in tires. Benzene is suspected of causing various types of leukemia with prolonged exposure. Benzene fumes are released when the rubber is heated. Carbon black, used to blacken the rubber in tires, has caused serious respiratory effects after long-term inhalation, the Canadian Center for Occupational Health and Safety reported. Fine particles of carbon black accumulate in the lungs and can cause reduced lung function, emphysema or chronic bronchitis. “Limited animal and human evidence suggests that significant and potentially irreversible lung effects may occur with exposures to high airborne concentrations,” the report asserted.